When was the last time you took a good look at your kitchen decor? Since we’re in the kitchen so often, it’s easy to take its design for granted. If you haven’t updated your kitchen for a while, maybe it’s time for something new. One of the biggest ways to make a splash in the kitchen is by adding color. 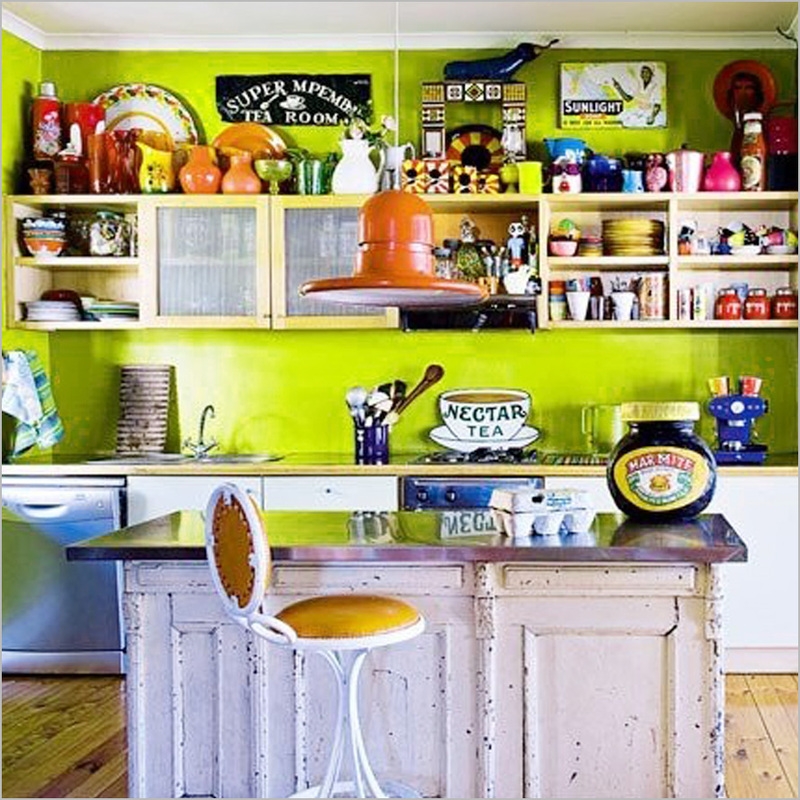 Check out these creative kitchen ideas for adding color to an often overlooked room. 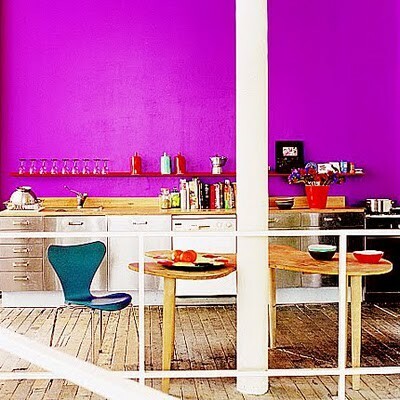 Perhaps the easiest way to bring color to your kitchen is to paint the walls. One or two bold colors can instantly transform your space for just the cost of a few cans of paint. This purple wall brings life to an otherwise plain space. And don’t feel you have to limit yourself to just one bold color. This kitchen uses two bright colors, one on each half of the room, to bring balance and interest that balances the white floors. One or two bold colors can instantly transform your space for just the cost of a few cans of paint. Don’t forget about your kitchen cabinets! Many people think they must stick to the basics when it comes to cabinets, but don’t limit yourself to white or wood. Your cabinets make up most of the wall space in your kitchen, and they are the perfect place to inject some color into your home. 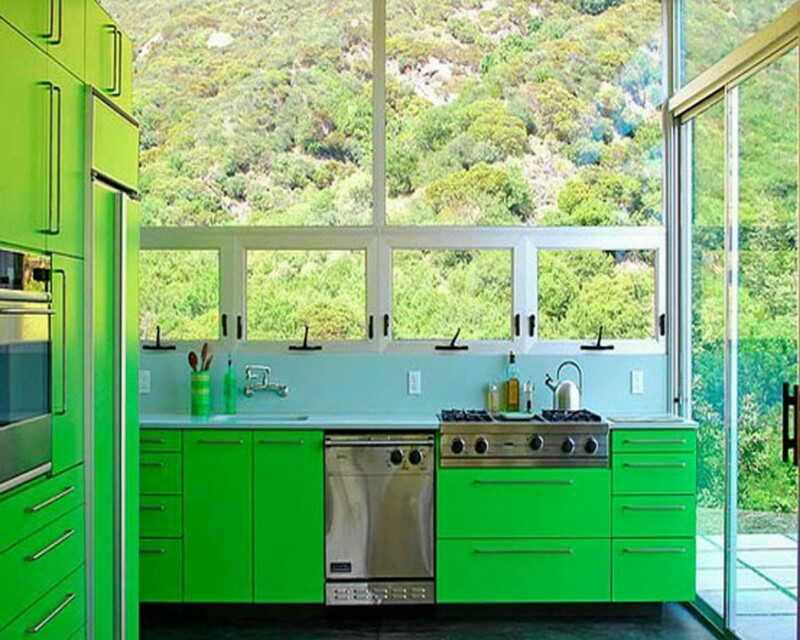 More example of green kitchen ideas. This bold choice brings the outdoor color inside! 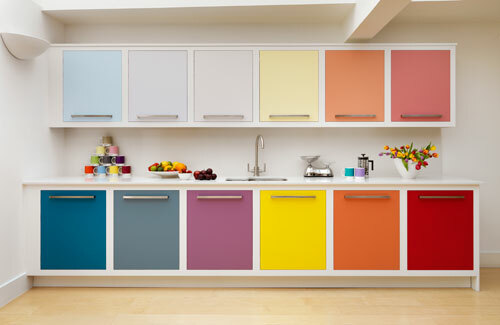 You can even bring the rainbow into your kitchen by choosing different colors for each cabinet door. Dark blue cabinets is understated but bold.Remember, you don’t have to rip out your cabinets and install new ones to get color in your kitchen. Most cabinets can be painted, so why not go for a colorful, new look? If your cabinets are plain wood, you can go big with a bold, colorful pattern. If you’re looking to unify your color choices, go monochromatic. 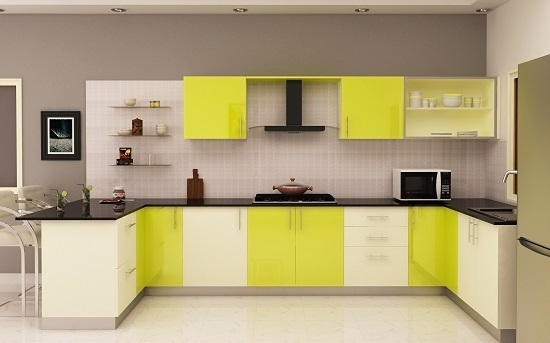 Choose one color you absolutely love, then bring the full range of shades and tints into your kitchen. Immerse yourself in color without being overwhelmed. This blue kitchen brings together several different shades into a lovely, unified presentation. From the sky blue floors to the subtly shaded stools, the design carries color throughout. Check out the different shades of blue in the tiles. Immerse yourself in color without being overwhelmed. The uncluttered look proves that colorful can still be classic. 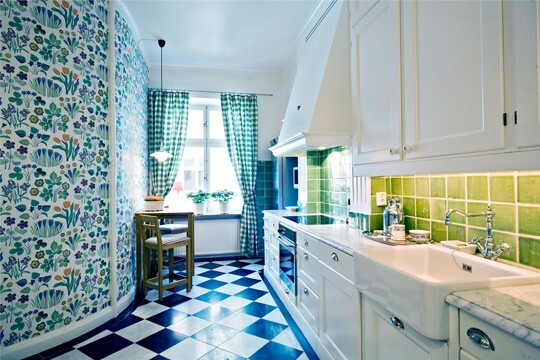 Choosing some bold patterns for your kitchen is a great way to add both color and visual interest. Don’t be afraid to experiment – these bold choices can pay off in a big way. Wallpaper with a bright, bold pattern brings energy into the space. 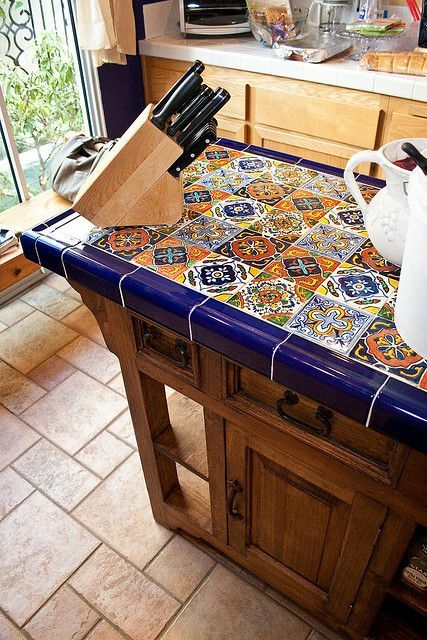 Or, choose boldly patterned tiles for a counter top or back splash. Antique pieces and vintage accessories are usually very colorful on their own. Bring several of them into your kitchen, and you have a lively, eclectic mix that’s colorful and interesting. They can also serve as great conversation pieces and bring back memories from days gone by. 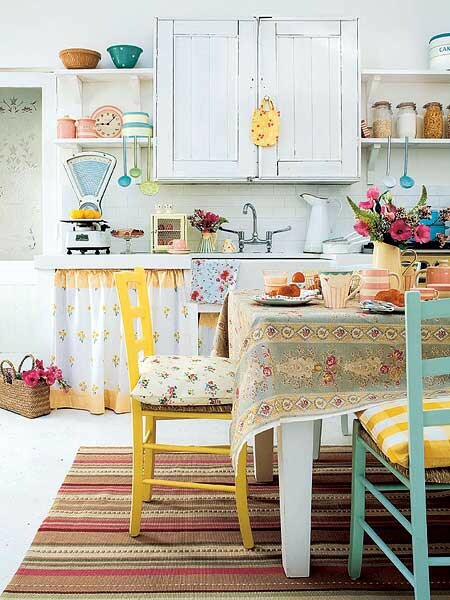 This kitchen uses open shelving to showcase a wide variety of colorful vintage items.This kitchen showcases a few vintage pieces as well as a beautiful collection of shabby chic textiles. Perhaps your budget doesn’t allow for a full kitchen makeover, or you’re stuck with the white cabinets in your rented space. Maybe you’d like to experiment with color but you’re wary of committing to bright paint or green cabinets. 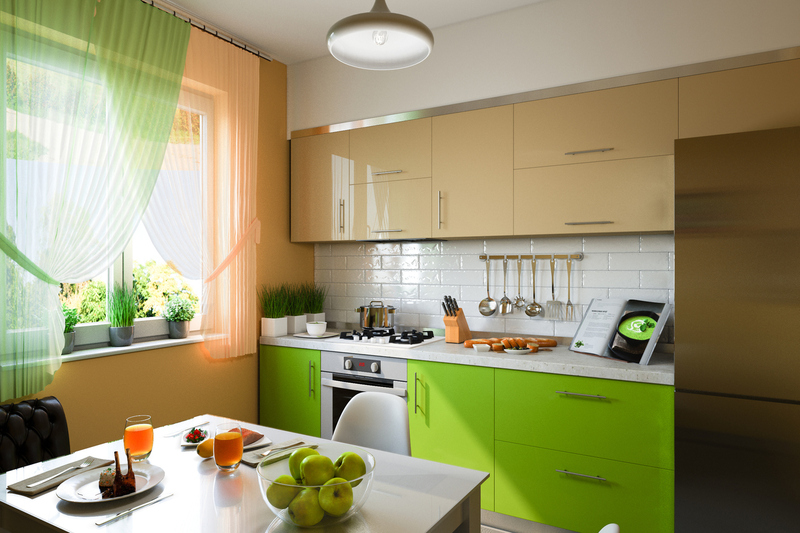 You can still bring spring color into your kitchen with a few easy and budget friendly splashes of color. Rather than buying new furniture, consider colorful slip covers. These accents add soft elements to a hard, angular room and are easy to make.